What is enroll? How does the enroll work in eShop? Jan Procházka - What is enroll? How does the enroll work in eShop? Enroll is technically the course assignment to the user. It doesn't matter if you assign course internally as an teacher, or student makes an self enroll through the internal course catalog, or purchases the course through an eShop. There is always enroll that ensures the course is assigned in the LMS and starts all internal workflows, such as due time countdown, email notifications, reporting tracking The price for enroll is given by the Course type, see the pricing table. 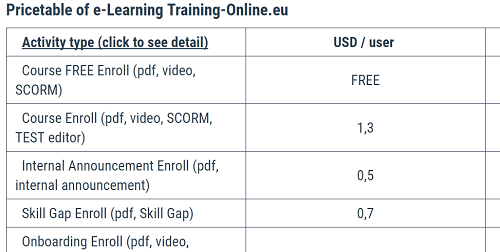 That's what you pay to Training.Online.eu and may vary from 0 to 2,6USD (as per actual pricing) per user enroll. In case, you have switched on the eShop functionality, you should set your own price for the course that will be sold through eShop and the price is based on your consideration. The price is set in Courses / Course entry edit. When the buyer makes the purchase the enroll is performed. This means the enroll happens after the payment to your eShop is confirmed by PayPal service. The difference between your eShop course selling price and course enroll is then your profit and added to your PROFIT account in the Wallet module.